NASA’s InSight (Interior Exploration using Seismic Investigations, Geodesy and Heat Transport) lander successfully touched down on the surface of Mars on 26th November after an uneventful six-month journey followed by a harrowing seven-hour descent watched by science enthusiasts across the globe. But InSight’s true mission has hardly begun; to take the ‘vital signs’ of Mars and thus allow us to learn more about the Red Planet than ever before. Its hoped that this study will help understand the formation of the rocky planets in the solar system as well as rocky exoplanet outside of our region of space. What does Mars tell us that Earth couldn’t? The first obvious question about the study of Mars’ interior is why would this tell us more about planetary formation and origins that a similar study conducted on Earth would? The answer is that Mars has been a less geologically active planet than Earth has during the history of our Solar System. 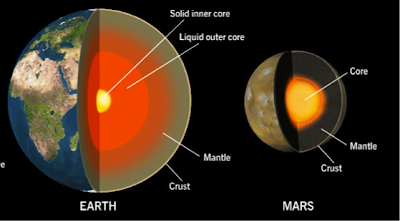 Lacking plate tectonics and destructive events such as plate subduction mean that Mars retains a more complete record of its geological history in its core, mantle, and crust. These features are only present on Mars because it is of sufficient size to have undergone internal heating and differentiation, the mechanism which separates these layers, whilst being small enough to have not undergone events which destroy early evidence of these processes. NASA suspects that Mars may be the perfect candidate for this, a ‘Goldilocks’ planet. InSight will examine the thickness, density, and structure of Mars’ interior in addition to measuring how heat escapes from the inner layers to the surface, thus getting a broader picture of planetary evolution for rocky planets. InSight’s 2.2-meter solar panel array has successfully deployed and seems to be collecting enough sunlight to ensure continued operation. A relief to anyone who remembers the ESA’s Rosetta lander, which landed in such a position on the comet 67P/Churyumov–Gerasimenko, that it was unable to collect enough solar-power to function, thus ending its mission early. 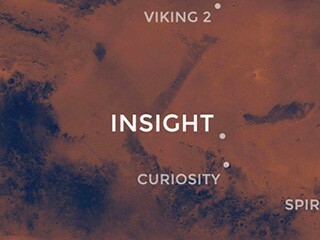 The current task that faces the InSight team is to discover exactly where it has landed. The team knows that the unit is tilted at 4⁰ implying that there is a rock under one of its three legs. From the initial images taken by a camera on the lander’s robotic arm, it appears to have come to rest it a hollow, a crater that has been filled with sand. Researchers will attempt to use the diameter of the crater’s edge, which is in sight of the unit’s camera, to estimate its depth. The team has a further resource at their disposal which could help them find InSight’s position. The Rotation and Interior Structure Experiment (RISE) comprised of two listening-antenna, can be used to listen to signals from passing orbiters to ascertain the lander’s longitude and latitude. As RISE conducts this extra role it will also fulfill its primary function, namely to listen for ‘wobbles’ in Mars’ North-Pole as the Sun pushes and pulls its orbit. It does this by using the doppler-shift and ‘bunching’ of sound-waves that causes the sound of an approaching or receding siren to change tone. This will allow researchers to determine the size, density, and composition of the planet’s core. The pertinent question being, whether it is liquid or solid iron. One thing in particular that InSight will be looking for is evidence that a liquid core once existed on Mars. Finding traces of this would suggest that Mars at some stage had a magnetosphere like Earth, protecting it from bombardments of charged particles from the Sun, known as solar winds. It’s the magnetosphere on Earth that has prevented the planet’s atmosphere from being stripped away by diverting these particles around the planet and away. Thus, evidence of a magnetosphere from add credibility to the idea that Mars once harbored life. It is suspected that Mars’ smaller size meant that violent ‘churning’ in its core ceased long before Earth’s will, thus ending the protection from charged particles, which would then be free to strip the planet’s atmosphere. Thankfully, even though InSight missed its planned target landing zone, the crater is mercifully devoid of rocks and those which are present shouldn’t pose a threat to instruments. Despite this, the surface is firm enough to support the lander for a prolonged period. 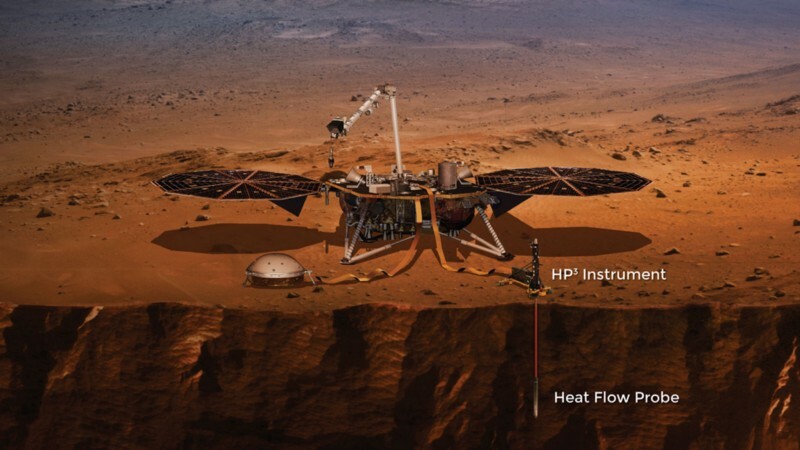 That is extremely good news for InSight’s Heat Flow and Physical Properties Probe or HP³, which should be able to drill down and penetrate the loose material of the crater well. The temperature probe, designed by a team from Germany, Poland, and the US will uncover how much heat is still flowing from the planet’s core to its surface by burrowing 5 meters deep pulling with it a ribbon of temperature sensors. 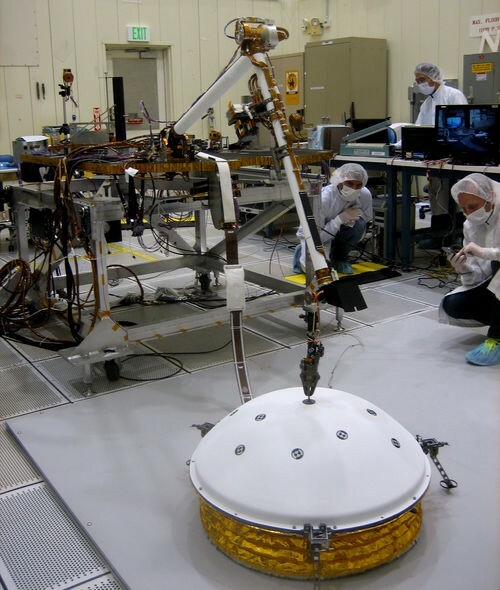 By measuring changes in temperature the probe will help determine how effective a conductor Mars’ interior is and then infer if it is made from the same elements as the Earth and moon and how much heat currently passes from the interior to the surface of the planet. 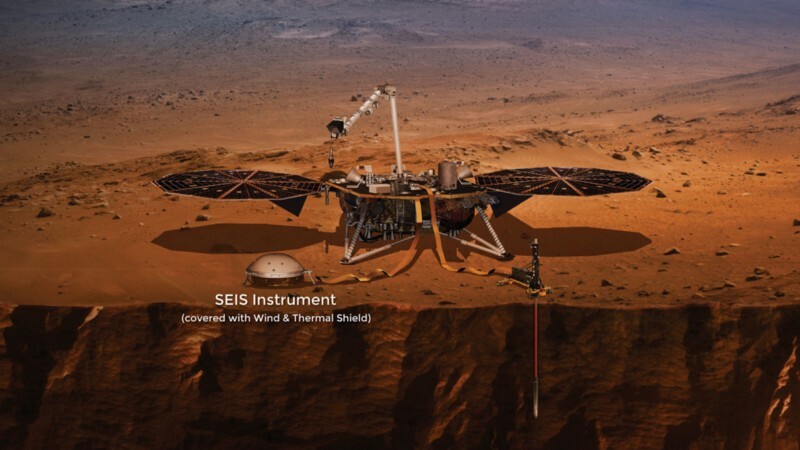 NASA test the deployment of SEIS via InSight’s robotic arm. The next task will be for InSight’s robotic arm to deploy the Seismic Experiment for Interior Structure (SEIS)on Mars’ surface. 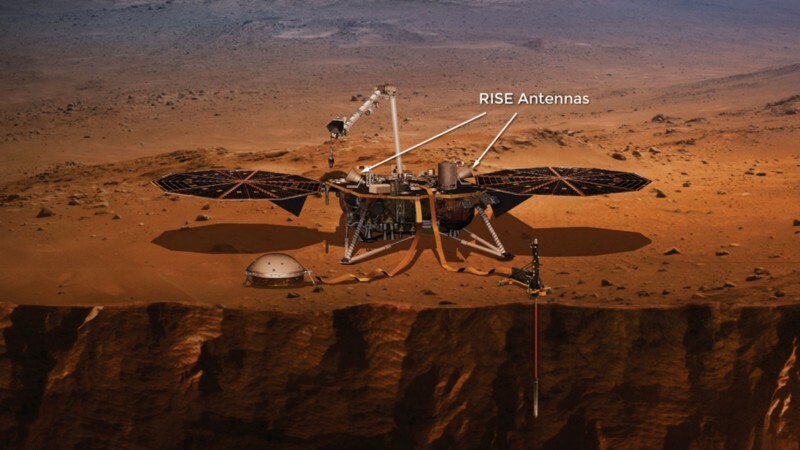 This should take roughly three months, after that, InSight should be ready to begin detecting an expected 12 to 100 Marsquake’s per year over its two-year-mission. SEIS will also monitor thumps made by the impact of asteroids and disturbances in Mars’ atmosphere and weather conditions after being deployed. It does this by monitoring seismic waves as they pass through Mars. This will also help researchers develop a picture of the composition of the crust, mantle and even perhaps the core of the planet, as the speed at which these waves travel tells us a great deal about the material they are traveling through. The team will be monitoring the results closely as astronomers believe that areas 600 to 1200 miles from the landing site may have experienced volcanoes as recently as 1 to 10 million years ago. A change in seismic waves could indicate volcanic trenches laid down at that time. Whilst the excitement surrounding the live landing of InSight and the first images it has sent back is understandable and totally warranted, it shouldn’t escape us that this mission has barely begun. 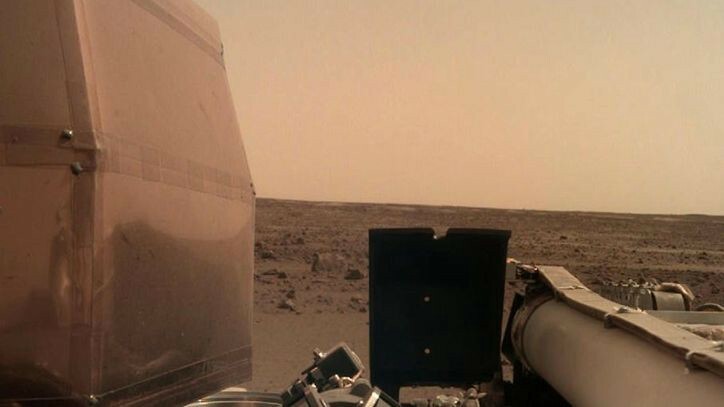 It may well be the eighth probe we’ve landed on the surface of the Red Planet, but it is going to be the first to go so much deeper than that surface. NASA has described InSight’s experiments as ‘taking the vitals’ of Mars. Whilst this is an apt, if whimsical, description of measuring qualities such as temperature and pulse, it should also remind us that we are treating Mars as much more than a landing platform now. We are probing its history, composition, and ecosystem much deeper than we have ever before.